The question I received was “You have convinced me that diversity is important. But how do I go about achieving diversity on my board?” I knew that excellent question would arise. 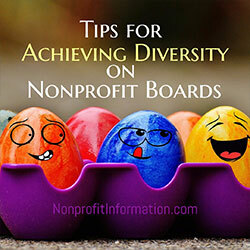 First, identify the diversity you would like to include on your board. Perhaps you realize the need for young people on your board or African-Americans or program participants. Then tell your board and staff members about this need. Ask them to send you information about the individuals they are recommending. If you do not receive sufficient names of applicants this way, check with groups in your community which serve individuals in whichever diversity you are seeking. Ask the local boy scout or girl scout troop for recommendation of young people. Ask the NAACP President to recommend African-Americans. Check with the Hispanic Community Center or the pastor of the Hispanic Church to obtain names of possible Hispanic board members. If you would like program participants specifically to join your board, send a brief note to all present and past program participants, asking them to volunteer or to recommend others. Give the board’s Nominating Committee the responsibility of reviewing the various recommendations you have received. Then have a member of the Nominating Committee set up appointments with prospective members. You might want to hold the meetings in the organization’s office and include a tour e.g., day care program, senior citizen center. Holding the meetings at a local coffee shop may work as well. Make appointments to see several individuals in each category. Leave enough time to set up the appointments and to hold them before board nominations are due. Remember that many individuals you visit may decline an invitation to serve on your board. Start by telling the prospective board member about the services provided by the organization. Tell the individual about the board’s role in setting policy. Give the individual a copy of a board member job description. Make sure you emphasize that all new board members will receive an orientation. contact them soon. If you decide that you are not going to recommend them for a position, just be positive and thank them for the opportunity to tell them about your program. One recommendation I have dubbed the “Noah” approach. If your board is not diverse, try to name two African-Americans or Hispanics or young people to the board at the same time. Then the new individual might feel a little more comfortable. At each new board member’s first meeting, make the new board member welcome. Make sure to have all present board members introduce themselves. It is not necessary to identify their “diversity.” They will know right away that they are the only program participants or African-Americans without you having to announce it to the entire board. 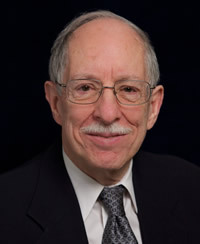 After the meeting, make sure the Nominating Committee member who met with the individual, now a board member, calls that individual on the telephone. Answer any questions the individual might have. Thank them again for attending. Remind them of the date of the next board meeting. You will find that diversities disappear. The new board member who may have seemed “different” now is just a board colleague who has an interest in promoting your organization or program. Michael is also the author of 3 books listed below available on Amazon. How Can Nonprofit Boards Develop a Merger Mindset?